When I first heard of QuickZip I knew it was something I needed. With 3 kids this item is a must have. QuickZip isn't just a standard sheet, it is a sheet that has a fitted base and the actual sheet part unzips so you can easily change sheets. Perfect for baby's crib when their diaper leaks, or if they spit up. Perfect for toddlers who are potty training. Perfect for kids when they're sick, and the list goes on and on. 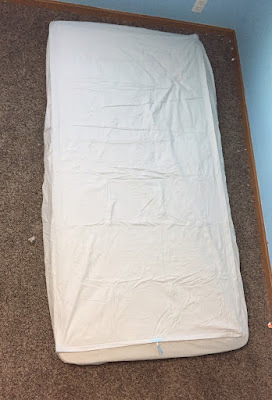 It is a fitted sheet that wraps around the corners of the mattress like any other fitted sheet, but then the middle top of the sheet unzips and you can easily zip on a new one. It is perfection! The white you see here is my son's mattress protector. The sheet just zips onto it's fitted base, making it super quick and easy to change sheets AND takes up less space in the laundry. You line up the tag on the top of the sheet (you can see the sewing thread of it here) and the tag on the base to know where to start the zipper. Now, I feel maybe I jinxed it. My kids never get physically sick, it happens once every couple years in this house. But magically the week after getting this sheet, my 4yr old got Rotavirus, so we really got to put this sheet system to use. And it works magically! I loved that I could just unzip the sheet, zip on a new one and wash it clean super easily. I could put this and his comforter in the washer and it all fit because of the small size of the sheet itself as opposed to the whole base and everything. Overall this system is awesome and fairly affordable. Comes in sizes from Crib to California King. They offer the starter pack and they also offer additional top sheets. They also have mattress pads, playard sheets, pillowcases and more. Overall: ***** Love the system and it works perfectly for our family. I like how fast it is. I learned that they even have a size XL for dorm room beds. Those college kids make a mess of their neds, this is very handy for them! I learned that they come in all sizes from crib to california king to XL Twin! I love that once the base is on, you'll never have to pick up the mattress again - very difficult for someone with Rheumatoid Arthritis to lift the corners of a California King mattress... this is a heaven-sent! I love that the QuickZip Zip On Sheets eliminate sheet corners coming off all the time. I really like the gray dot crib sheet. I learned QuickZip is a proud sponsor of the Arthritis Foundation Bone and Joint Expo. I learned that Quick Zip is great for Adults with muscle or joint pain such as arthritis or a bad back! I like that it would be so easy to use on the top bunk in my son's room. I like their Flat Mattress Pads. Look pretty comfortable.